We have this gigantic ice maze in downtown Buffalo, at least we did yesterday, for our new Powder Keg Festival. That is a great name, by the way. Powder = snow and keg = beer. That is a picture up above of a tiny sliver of our massive ice maze. It is by HSBC Arena where there is the Tim Horton's where I walk to sometimes when I need high-octane coffee. When I walk there today will the ice maze still be there? Could I get lost in it? And what next? Will it eventually melt into a torrent of ice water? Will it crumble little by little? Our ice maze was declared officially the world's largest, according to the Guinness Book of Records. At first that made me laugh. I mean, how many other ice mazes are there? It would be like me getting into the Guinness Book of Records for the world's largest ice sculpture of Leonard Pennario. But now it turns out that our ice maze has plenty of competition. 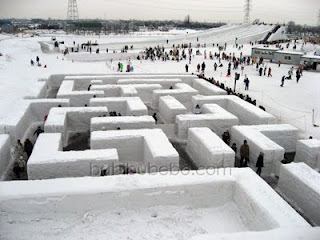 Here is a made-in-Japan ice maze. 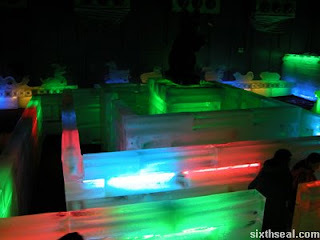 Here is an ice maze somewhere else, I don't know where, but it is lighted up beautifully. 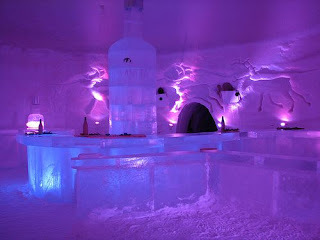 In Lapland they have elaborate ice mazes and they also have this ice bar. Isn't that pretty? 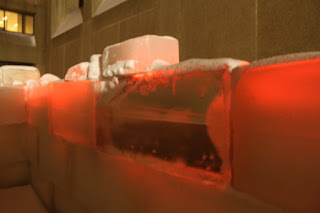 I love that ice bar. I keep sitting here staring at it. I have had quite enough ice of any kind, lol. Would that I were going to Hawaii! But yes, they are pretty. Ha, ha! Would that we were both going! How about that Hawaii tsunami?